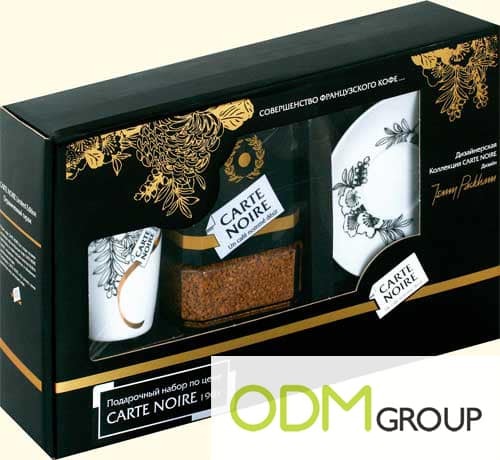 Carte Noire is a leading premium coffee brand in France. The name and logo symbolized luxury and privilege. Its black and gold packaging evokes quality. Its intense aroma and well-balanced taste allow it to stand out from the competitor. Carte Noire is giving away ceramic coffee set with every purchase for free. This promotion was spotted at supermarkets in Russia. This is a set of coffee mug and plate that come in a gift box. A very stylish on pack promo gift indeed. For those who can’t do without their coffee, presenting this ceramic coffee set is guaranteed to make them like you. There are so many different ways to use promotional ceramic coffee set as on pack promo. Logo imprinted coffee sets can be used in many different ways as well. You can fill the containers with coffee and creamer packets. And the best thing about using items like those is that you know that they will be used for many years and will continue to serve as a nice promotional item for your business. This on pack promo offers great room for advertising as well. Choose the perfect style and color that will really make your logo shine. Promotional items really get people’s attention. One more advantage of this promotional product, they will useful for your customers as well. Кофейный набор с логотипом Вашей компании – это очень популярный сувенир, пользующийся большим спросом на рынке сувенирной продукции. Кружка с логотипом или слоганом может стать недорогим и полезным подарком Вашим сотрудникам, клиентам, партнерам и просто знакомым. Сувенирные керамические наборы с офисной символикой в офисе – это уже почти правило хорошего тона для любой компании, это недорогое, но важное решение для повышения статуса компании.